First pictures: Fiat 500 Cabriolet | What Car? This is the Fiat 500 Cabriolet, which will be unveiled in the metal at the Geneva motor show next month. The sardine tin-style cloth roof harks back to the original 1957 Topolino's, and means that changes to the structure of the standard 500 are kept to a minimum. 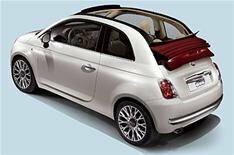 Fiat describes the roof structure as 'an unrestricted window to the sky'. Engine choices are the same as in the hatchback: a 74bhp 1.3-litre diesel, and 68bhp 1.2-litre and 98bhp 1.4 petrols. The engines all have Fiat's fuel-saving Start&Stop system as standard. The 500C goes on sale in May and prices are expected to start at around 10,000 -1500 more than the cheapest hatchback version.